Juicy erudition: A Vidal reader for readers who (for some reason) won't read all of Vidal. 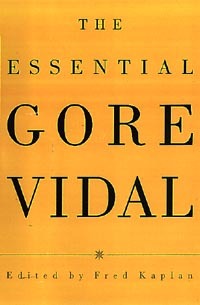 Between himself, his relatives, his lovers, and his friends, there’s hardly any figure in recent history – from JFK to Sartre to half the stars and starlets in Hollywood – whom Gore Vidal hasn’t known. And if one includes in his mental address book all the important people he’s met through books (those of others and those he’s written himself) it seems fair to conclude that, short of God and Santa Claus, Vidal is as close to an omniscient being as earth, or at least America, can produce. What’s more, he’s never been shy about admitting it, which is why the new collection of his works, modestly titled The Essential Gore Vidal (the suggestion here being that you can’t read all of him, although, of course, you should), seems less the product of a single writer circumscribed by space and time than the greatest hits of a score of authors existing on some cultural astral plane. Essayist, novelist, memoirist, polemicist, and gossip, a product of upper-class Washington, D.C., and a relation of Al Gore Jr.’s, Vidal has been a writer for 50 years, spreading around his opinions like the weather and managing a startling thunderstorm every ten or so. The first loud crack came in 1948 with The City and the Pillar, Vidal’s third novel, the story of two young male lovers (gay is a term Vidal famously detests, perhaps because he didn’t coin it himself and also out of his long-held belief in universal bisexuality) who meet again as grown men and don’t quite click, resulting in a burst of sexual violence. Naturally, the book made waves, and the new volume excerpts only the “good” parts, giving readers a chance to reflect on just how little it took to rock the boat back when gentlemen still wore hats in public: “Now they were complete, each became the other, as their bodies collided with primal violence, like to like, metal to magnet, half to half and the whole restored.” Years later, Vidal toned down the violent ending and purpled up the prose (both versions are printed here), but the shock of the book’s original publication is something today’s generation must take on faith, like the furor over Elvis’s hips. Vidal spent much of the fifties in lively commercial work, spinning screenplays and teleplays in Hollywood, turning out a couple of Broadway dramas, and gadding about with the likes of Tennessee Williams, step-relative Jacqueline Bouvier Kennedy, and pretty much everyone else a nineties time traveler would want to go back and share a cocktail with. Fortunately for us, Vidal provides the time machine in his writings, particularly in the unequaled essays that are part gossip, part rant, part reminiscence. His patented style of juicy erudition, whether applied to the myth of Camelot, the personality of Orson Welles, or the career of Ronald Reagan, offered something new to literature that even his built-to-be-banned works – the scatological screenplay for Caligula; the transsexual meta-fable Myra Breckinridge – couldn’t really match. Vidal’s posture as an essayist is always that of someone who was there – sometimes in spirit, usually in person. Having sat at the table alongside the immortals, hearing their words while watching their games of footsie, Vidal is a sort of reflexive reductionist. As someone who’s seen greatness with its zipper down, he’s not impressed by rhetoric and imagery, though witty self-awareness can impress him. In the essay “The Holy Family,” he esteems JFK as “an ironist in a profession where the prize usually goes to the apparent cornball,” but then derides him as a chameleon who changed complexion according to the polls and the latest orders from Big Daddy. For Vidal, a politician is never more dangerous, and the citizenry never more endangered, than when he becomes spellbound by his own posturing. In this respect, and only in this respect, was the lighthearted JFK to be preferred over the more serious-minded Bobby: “The McCarthy friend and fellow traveler of one year emerges as an intense New York liberal in another, and between these two happenings there is no thread at all to give a clue to what the man actually thinks.” Vidal pins the Kennedy men’s charm on an amoral “cold-blooded jauntiness” that he fears will turn into a full-blown royalist cult. Vidal, in his prime, was in fact full of fears that haven’t come to pass. If he had an intellectual weakness, it was his ability to scare himself – to fashion vivid scenarios of doom out of his vast learning and experience. In “Pink Triangle and Yellow Star,” he starts by nimbly satirizing the hysteria of certain New York intellectual homophobes but ends with his own somewhat hysterical vision of a coming racial and sexual genocide. In 1971’s “Feminism and Its Discontents,” he correctly predicts the backlash against the women’s movement, but gets bogged down in grim, Malthusian visions of global famine: “It is very simple: we are breeding ourselves into extinction. We cannot feed the people now alive.” For Vidal, the sexual revolution, and its attendant liberation movements, have their ultimate justification in the threat of overpopulation and environmental catastrophe rather than in the appetite for freedom, say, or a basic desire for social justice. To be fair, Vidal credits those causes as well, but his need to pound the apocalyptic gong at times drowns out his exquisite rationalism. But no matter how grand and abstract Vidal gets, his subject is always people, and his gift is to treat all of them, even dead near-deities, as peers (and sometimes, outrageously, as inferiors). In “Theodore Roosevelt: An American Sissy,” Vidal writes about the Rough Rider’s early manhood as if he were remembering a college classmate: “Give a sissy a gun and he will kill everything in sight. TR’s slaughter of the animals in the Badlands outdoes in spades the butcheries of that sissy of a later era, Ernest Hemingway.” Far from being a term of derision, sissy is a label of knowing affection here; it’s Vidal’s way of saying Oh come on, I know your type. And finally, that’s what he believes in: human types, a gallery of Platonic personalities that mortal individuals merely borrow and get to wear for a time, like movie costumes, before being forced by death to hand them down. It’s a theory he puts in the mouth of Myra Breckinridge, the carnivorous gender-bending Hollywood vamp and Halloween-drag-party version of the author: “Olympus supports many gods and goddesses and they are truly eternal, since whenever one fades or falls another promptly takes his place.” If the essence of Vidal’s satire is pretending to know, or have known, everyone who’s ever been anyone, transforming history into tattle and tattle into history, it’s because there are so few people, in the broader, cosmic sense, worth knowing.